The inspiration for this outfit comes from an old issue of Lucky Mag; I was searching my blog archives and came across this post where I'd scanned several pages with looks I wanted to recreate. The pink skirt and mint bag are spot on, but I toned it down a great deal with a less busy jacket, simpler shoe and more minimalist jewelry. Don't forget to enter my Polette Eyewear giveaway! 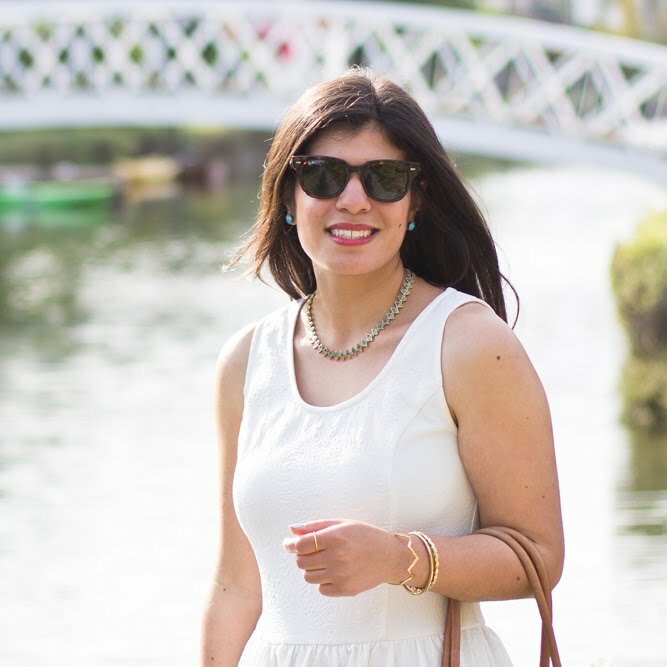 Linking up with Cute and Little's Color Brigade! I adore your recreation! The jacket is really perfect for it! I love the mint and pink together! I actually like your version a lot better than the one in Lucky! The mint and pink are so pretty together. This is an inspiration that will never go out of style! You look beautiful! I seriously have old magazines that I still get inspirations from too. You did a lovely job with this look! 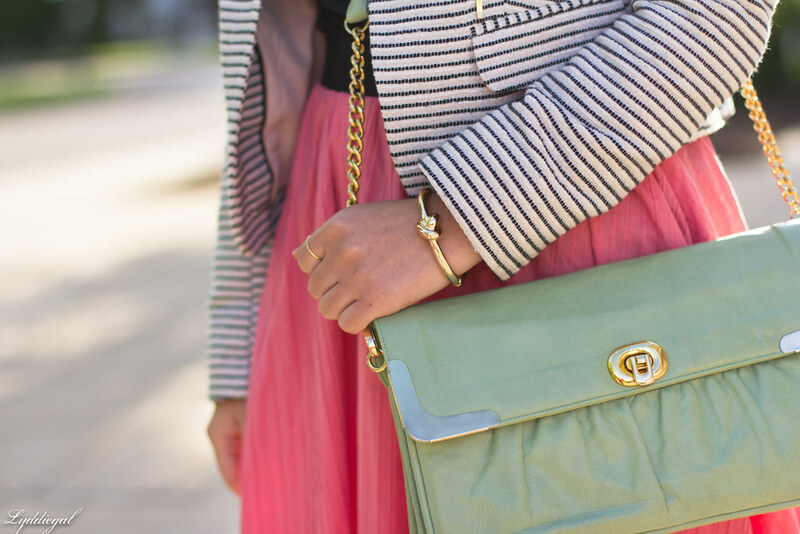 I love the pink, mint and stripes! I love the shoes and the jacket! I really like your jacket and shoe choices much more than the lucky get up. It's difficult to translate some of those ensembles occasionally, but I think your take is great. That blazer is awesome. The texture brings a lot to the outfit. I think you did a great job recreating the look! I always like to look back at my old posts to see if I can find some inspiration! So pretty, simple and feminine, love it. Mint and pink is a nice combo. Lucky mag is always good for inspiration. I love how you recreated this - that jacket is super stylish! You look real Cute in Mint & Pink. Too cute, doll. You styled this perfectly! Love finding inspiration in all sorts of places--and a outfit like this is classic never goes out of style :) You look darling! I've got to say you look so fresh and stylish, that outfit turned out just great:) I love the femininity of it and the way these colors compliment your skin and hair tone. Seems like you are so meticulous in your dress! Super gorgeous! I love this color combination, so perfect! Your inspiration may have been three years old, but this look is very much now as far as I'm concerned. [And since I'm currently watch Veronica Mars, I'm vividly remembering how we all dressed several years ago - it's terrifying.] 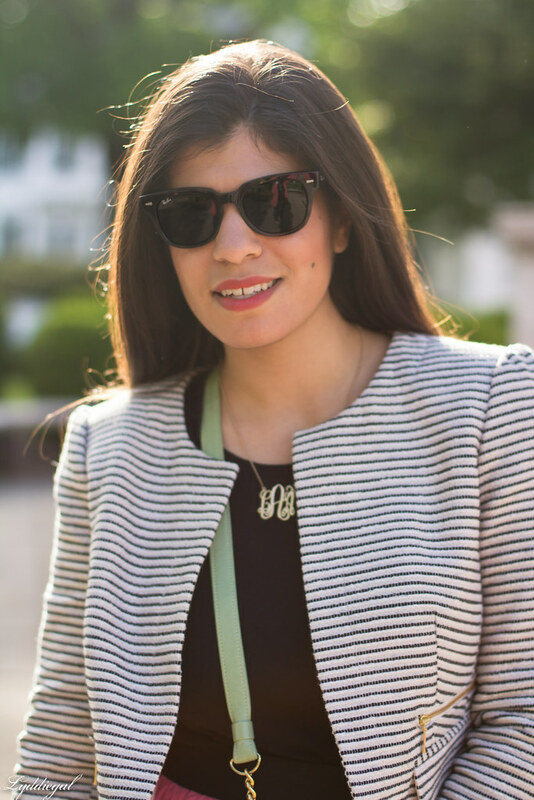 I would never have thought to pair mint and pink myself but I love the result and as for that striped blazer, well... what doesn't a striped blazer go with? OK this look is totally classy and feminine and forever stylish so no fret over it being 3 years ago. I adore the circle skirt you made. Your monogram necklace and mint bag are lovely. Looks really pretty together Lydia! It works! Love the pink, green and stripes. Nice! The great thing about your style is that it's never too trendy. It's always classic with a teeny bit of whatever is hot now but not enough to make it not look classic! The pink and mix look great together!! What a great jacket! Great recreation. I love that you can sew and recreate the skirt. The texture of the skirt is perfect subtle pattern mixing. You look gorgeous! The mint and pink are spot on. I love finding inspiration like that and rediscovering things I was drawn to in the past. Great combo of colors! SO pretty, Lydia! I love the soft mix of colors and your pattern jacket. I'm always ripping out articles for inspiration...This looks fab, I love the pink skirt! Love finding old inspiration! This outfit is perfect!! Wonderful to know and see inspiration behind outfit. And it is all about inspiring and creating your own, true to your personality. 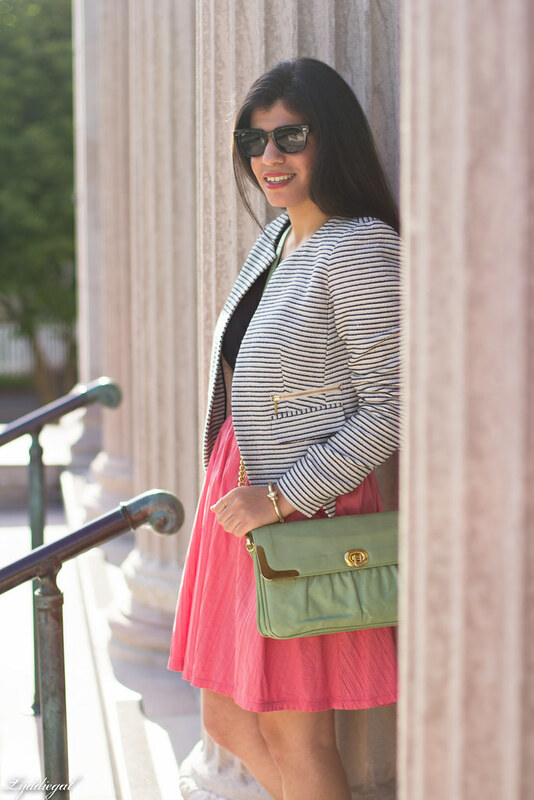 I love these pretty colors paired together and striped jacket is just perfect. Love stripes I think they looks perfect with any look, so timeless and versatile. I like the outcome - and its totally current, you know that. That mint green bag is lush!